Teabowl also printed in brick red, 7 cm diameter by 4.5cm high. Print of the Tea Party as on the saucer but without the tree above and the urn on plinth to the right. Saucer printed in brick red with a painted loop and trefoil border. 11.5 cm diameter. 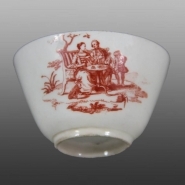 The print of the Tea Party is identical to a print on Worcester porcelain. It can also be found on enamels. Three sherds of this print were found on the Bow factory site. For more information see English Ceramic Circle publication Bow Porcelain, On-glaze Prints and their Sources. Gordon and Sue Guy-Jones.